Large Marge is moving on up! It may not be a deluxe apartment in the sky, but Large Marge is now in the second super laying eggs. I removed the top hive feeder as there was still quite a bit of syrup from the refill last week so it appears they are finding their own sources. There were lots of small hive beetle larvae in the feeder, but I still don’t see any in the two brood supers. I took the feeder far from the hive to wash it out and also squished all the larvae I could find. Hopefully any that did make it out will be eaten by my nematode army that I spread on Saturday. Here is a photo of a frame from the first super. 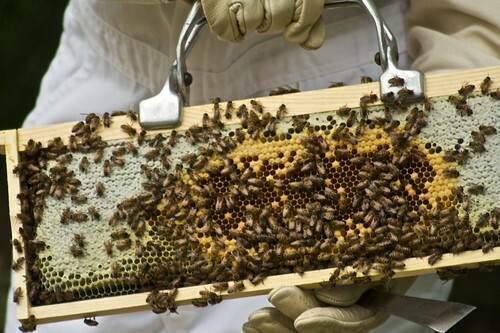 There is capped honey on the upper left and right of the frame and the middle has capped brood and bee larvae in various stages of development. I still did not add a 3rd super since the 2nd one still did not have the middle frames completely full of capped brood. Plus, I do not want to add a 3rd super with the hive beetles lurking about without enough bees to defend the empty frames. The way they are building, I’m hopeful that I’ll be able to add the extra super next week.